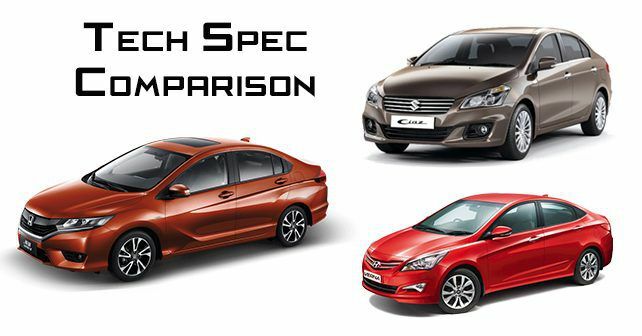 We take a look at how the Hyundai Verna and the Maruti Suzuki Ciaz fares in a tech spec comparison against the refreshed Honda City. The Honda City has, until recently, been the most popular choice among Indian consumers in the segment. But the sales of the City in recent months have dropped below the Ciaz. Thus handing over the most popular mid-size sedan crown over to Maruti Suzuki. Now Honda has decided to come back strong by revising the styling of the city with a new-design grille and front bumper, tweaked light clusters, new design alloy wheels on the top trim, and a revised cabin, in addition to a whole host of features to regain its peak position in the segment. We take a look at how the Ciaz and the Verna fare against the new and refreshed Honda City. Due to the cosmetic changes, the City is now slightly longer and wider than the outgoing model, however, it has the same wheelbase as before, which means interior space is where it loses out to the Ciaz and the Verna. Headroom will be better as the City is slightly taller than the competition. The Ciaz has the smallest engines on offer, but the diesel comes standard with the Smart Hybrid Vehicle System (SHVS) which allows it to offer best in class claimed fuel economy. But it is the Verna with 1.6-litre options in both petrol and diesel that provide the best performance. However, the base variant of the Verna for petrol and diesel come with 1.4-litre engines only. The Honda City continues to use the same 1.5-litre i-VTEC and i-DTEC engines. All three cars offer automatic options for the petrol engines. The Ciaz has a 4-speed AMT and the Verna gets a 4-speed torque convertor while the City gets a CVT option. As for the diesel, the Hyundai is the only one that is offered with 4-speed automatic. The Ciaz diesel only gets a 5-speed manual, while the City and Verna come with 6-speed gearboxes. The suspension setup for all three cars are similar to each other, and all three use disc brakes at the front with drums at the rear. The Ciaz and the Verna are offered with 16 inch wheels, the City gets 15 inch rims with 175/65 tyres. All three cars get ABS with EBD, rear parking sensors and reversing camera with dual front airbags as standard fitment. But the City and Verna get additional side and curtain airbags as well. To outshine the competition, Honda has thrown in a massive chunk of features with the new City. The Hyundai Verna is very well equipped, but Honda has tried to one-up Hyundai with the City this time as well with additional features like automatic cruise control, daytime running lamps and a sunroof. But the Ciaz falls behind the competition in features as it lacks telescopic adjustable steering, automatic headlamps, rain sensing wipers and cruise control. The Maruti Suzuki Ciaz offers best in class fuel economy and is the most popular car at the moment in the segment. The Hyundai Verna is the car that has the best engine on offer with the 1.6-litre displacement and also offers decent amount of features. Hyundai is also expected to update the Verna later this year which will put pressure on the Ciaz for a mild update as well. But going by the options and features that Honda has provided with the new City, and the cosmetic changes does make it seem like a very promising buy. As far as the prices are concerned, the Ciaz is the most affordable especially with the mild-hybrid diesel powertrain which draws the government’s FAME scheme incentives. However, while the Ciaz delivers in efficiency, it does lack in terms of engine performance and equipment. The Verna is priced competitively in both petrol and diesel options while the Honda is the most expensive of the lot. However, the the City’s engines are not as powerful as Hyundai’s. having said that, the City does offer better value for money with the amount of equipment and space it features.